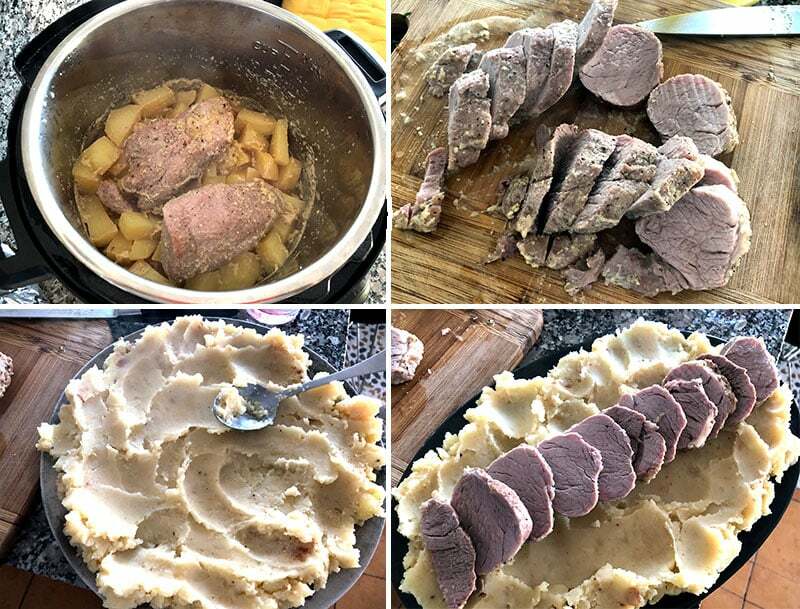 This hearty dish of Instant Pot cooked pork tenderloin and potatoes is perfect for the whole family. Served with a creamy mushroom sauce for a classic, comfort hit! First, season the pork tenderloin halves with the onion and garlic powder, salt and pepper and set aside. Turn the Instant Pot on and press the Sauté button. Allow to bottom heat up and add the olive oil. Add the pork halves and cook for 1 minute each side to seal in the juices. Remove the pork and press Cancel/Keep Warm to stop the sautéing. Pour the milk and water into the pot and use a spatula to scrape off any pork cooking bits and stir them into the broth. Add the diced potatoes and salt and stir through. Place the pork pieces on top of the potatoes. Close and lock the Instant Po lid and press Manual, HIGH pressure and adjust the time to 5 minutes. The Instant Pot will beep three times and the pressure will start building up (this should take about 5-10 minutes). Then, the 5-minute timer will begin (mind you that the cooking actually begins while the pressure is still building up). Once the timer goes off, allow 5 minutes for the pressure to release naturally (NPR) and then use the quick release method to let off the rest of the steam (be careful when you move the valve to Venting). While the potatoes and pork are cooking, prepare the mushroom sauce. Heat the olive oil in a large frying pan over medium-high heat. Once hot, add the onions and sauté for 2 minutes. Add the mushrooms and cook together for 6-7 minutes, stirring frequently. Then add the garlic and salt and cook for another minute or two. Add the white wine and mustard and stir through for a minute. Finally, pour in the cream and stir until well combined. Turn the heat off and set aside. 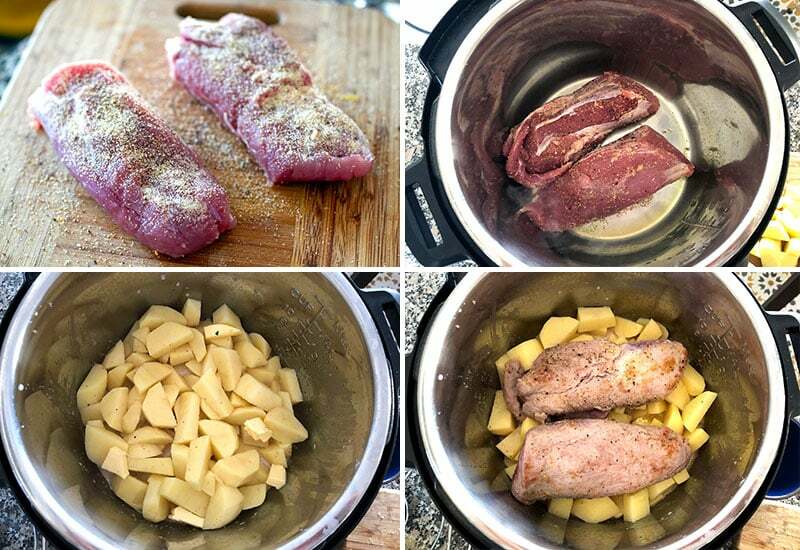 Open the Instant Pot and remove the pork pieces to a chopping board. Rest for a few minutes. Potatoes will be nice and soft but there will be a bit of the cooking liquid, including the juices from the pork which will flavour the potatoes. Pour half of the liquid out (holding the potatoes back). Add a tablespoon of butter and mash the potatoes in the remaining broth until fairly smooth. Taste for salt and add a little more if you like. Slice the pork into thick pieces and serve over mashed potatoes. 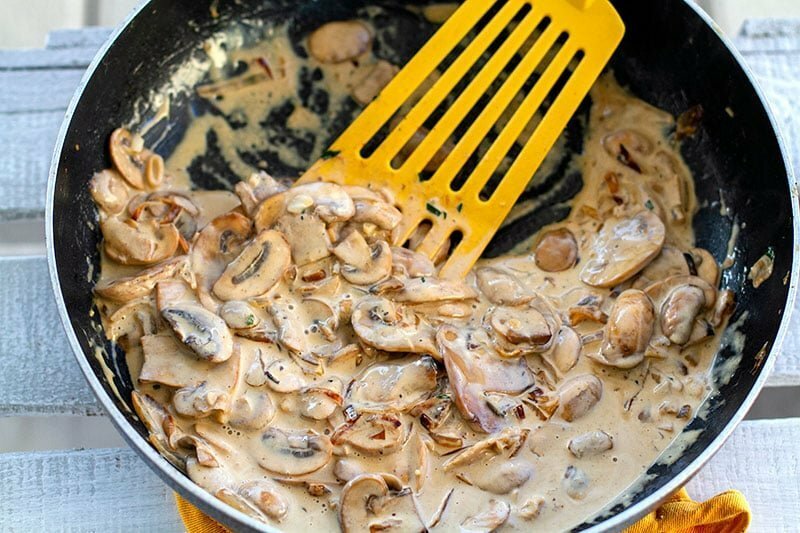 Top with the creamy mushroom sauce and sprinkle with fresh parsley. Chicken breasts could be used instead of pork tenderloin in this recipe. Pork and potatoes can be served without mushrooms sauce. You can use other condiments such as mustard, BBQ sauce, ketchup, apple sauce or salsa verde.